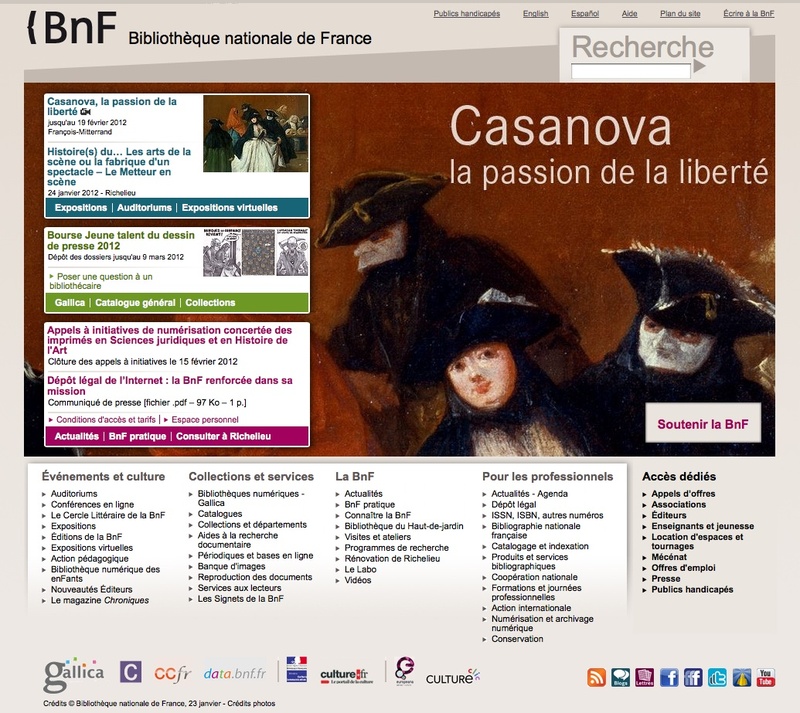 The Bibliothéque National de France (BNF) is a widely networked institution, providing digital access to its archives from 1987, when a large digitalization process of many multimedia resources, books metainfo and scientific journals was launched. Many and different archives are available for general users, who can move from traditional disciplines to cinema, advertising and manuscripts, using multiple search engine and browsing criteria. Four outstanding catalogues are provided for general and specific researches and a directory of interesting websites and contents is organized for researches by topic. A section is devoted to virtual online exhibitions. A complex content organization allows users to visualize info in different formats, to save resources in personal archives and to download and print pdf abstracts, pictures and detailed metainfo. While general access is free and easy, it is necessary to contact the BNF staff to retrieve full-text of recent scientific articles. The website is well organized with a clear content structured and an effective graphical architecture, and is therefore easy to navigate and use. The basic service information is also available in English and Spanish, while the original French version is more dynamic and graphically rich. Regularly updated and well maintained, the site features an advanced search for complex multimedia.